The classic triangular A-Frame cabin is a tried-and-true house design that was popularized in the 1960's, when it came to symbolize the joys of owning a vacation home. During these years Lindal Cedar Homes revolutionized the traditional 'swiss chalet' A-Frame design when they launched a patented construction kit for A-Frame homes that made it easier than ever for families to build a second home. Now, to celebrate the company's 65-year anniversary, Lindal Cedar Homes has unveiled an updated, modern take on their classic A-Frame that showcases sustainable materials and keeps construction waste to a minimum. Read on for an introduction to the Modern A-Frame! The story behind Sir Waltar Lindal (“Sir” is the translation of his given Icelandic name, Sculi) and his company Lindal Cedar Homes, is fascinating. After Lindal spent time in the Canadian Army during World War II inventing weaponry modifications, working up the ranks, and seeing the benefits of prefabricated housing at work in Army camps, he had the idea that the same construction methods could be used to create precut homes for the consumer market. He went on to develop a booming kit home business first based out of Toronto, then Vancouver, and now Seattle, where his children have taken hold of the reigns. An inventor at heart, Lindal holds over 17 patents, one of which is for an A-Frame cabin, which was pictured on the 1966 cover of Popular Mechanics. Lindal’s A-Frame cabin went on to become wildly successful with vacation homeowners because it offered an affordable way to build a beautiful and functional vacation home. Materials for the cabin came pre-cut and were delivered to the site, where they were assembled. The A-Frame cabin revolutionized vacation homes by utilizing a simple design with a high, steep, pitched gable roof, a two-story wall of glass on either end, living space on the bottom, and a loft upstairs. A glass wall allowed the owners to experience their surroundings in a whole new way without leaving the comfort of their own home. The home was also energy-efficient, inexpensive, and easier to build than other vacation homes out there, and they can withstand the elements through the years with little maintenance. Now in its 65th year, Lindal Cedar Homes chose to celebrate its past by reinventing their classic A-frame cabin and unveiling the Modern A-Frame. Staying true to the original spirit of the A-Frame, the Modern A-Frame is compact, bold, and features full-height glass walls, loft space, and the same no-nonsense building process that that accompanied the original. However this time around, the homeowner has the opportunity to customize the cabin and go beyond a simple triangular design. The Modern A-Frame is based on a system of three building blocks, which can be rotated to take advantage of different views and orientations. Flat or pitched roofs and various other additions can also be included to create your own dream home. Designs for the MAF are based on series of three predefined shapes that can be put together to create 18 different room types, which results in hundreds of different customized home designs. 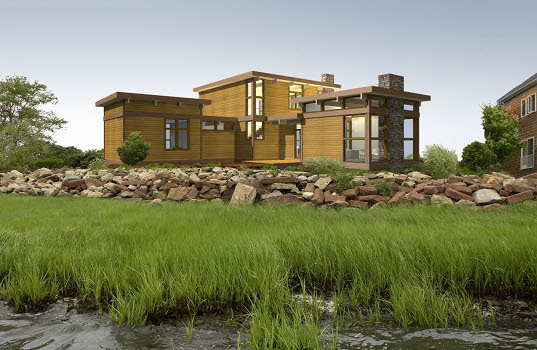 Five pre-designed homes are also available in sizes ranging from 1,200 sq ft to 1,900 sq ft. Lindal’s local dealers, most of whom are NAHB Certified Green Professionals, help design each home specifically for its site, taking into account environmental conditions and solar passive design. The homes are built with Western Red Cedar from British Columbia, engineered framing, and other sustainable materials, and they can easily accommodate photovoltaic and rainwater catchment systems. All of the parts for the homes are pre-cut and sent as a kit to the building site, minimizing the environmental impact of shipping. In the following weeks, we’ll be covering each of the Modern A-Frame homes in more detail through a series of posts — stay tuned as we explain the building process and show how easy it is to design and build a Lindal Cedar Modern A-Frame Home! I have always loved the A-frame design. I fell in love with the Icelandic history and culture a few years ago. Now, I have discovered a beautiful combination of the two. Thank-You Lindal Homes! What's up with that lawn in the first image? Why place a rendering of a building that claims to be sustainable on top of an incredibly manicured lawn- an icon of the unsustainable suburban landscape? It's like if McDonalds dediced to sell a McVeganburger and served it on a plateful of McRibs, or like driving a hybrid Hummer over desert turtles, or like so many bandwagon green schemes. Maybe these houses weren't meant to sustain the environment as much as Lindal's profits. These modern A-Frame homes are really gorgeous, and I love the story of Lindal's history in making the A-Frame popular! I'm glad to see that Lindal has added some nice modern designs to their line of homes. Although it helps that they are somewhat green (but could be more so, with LEED certification), they are quite expensive. This has kept Lindal to mostly the vacation home market where a pre-cut lumber package is delivered to a remote site, often in the mountains with a limited building season. Then homeowners can build it themselves to save on labor. Otherwise Lindal homes cost much more than average. This is both a beautiful Story and beautiful design for a building. A-frames are awesome - I remember spending summers at one as a kid - and it's inspiring to see Lindal's modern take on this classic, efficient design! I like the warmth of the A-frame. It's not as cold as some other modern green homes. Interesting story about Lindal\'s history - never knew! Love the fact that Lindal has revamped the A-frame to be green - it's the best of both worlds! This is so cool. Who knew that building weaponry could inspire this kind of innovation. Sir Walter Lindal started Lindal Cedar Homes in Canada back in 1945. He launched the company after he saw the benefits of prefabricated building during his service in the Canadian Army during World War II. He holds the patent on a specific style of A-Frame Cabin that was popular in the 1960s. Lindal's A-Frame revolutionized vacation homes and was pictured on the cover of Popular Mechanics in 1966. The original design featured a steeply-pitched gable roof and a two-story wall of glass on either end. A-Frame cabins were tremendously popular from the 1960's onward. Their simple, sturdy construction made them a great choice for families looking to construct a second home. 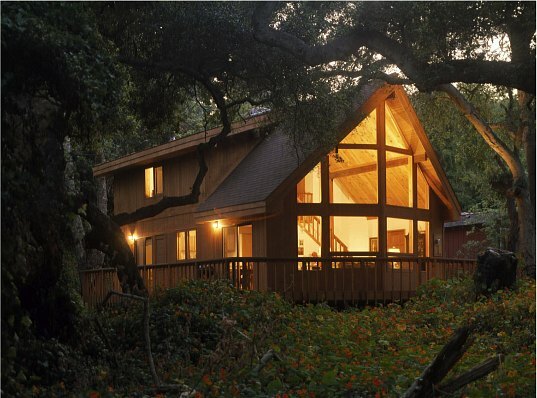 A-frame cabins are easy to manufacture, ship, and construct, and are less expensive than other vacation homes. The design came at a time when many families were embracing the opportunity to own a vacation retreat. Lindal's traditional A-Frame has seen slight upgrades and modifications over time, but it still largely consists of a steeply-pitched roof with large triangular windows on the ends. In honor of Lindal Cedar Homes' 65-year anniversary, the company has unveiled a redesigned A-Frame for the modern home owner. The Modern A-Frame is based on a system of three building blocks, which can be rotated to take advantage of different views and orientations. Flat or pitched roofs and various other additions can also be included to create your own dream home. The home plans consist of 18 different units, which can be put together in hundreds of different ways with flat or steeply pitched roofs. The Modern A-Frame series is based on three predefined shapes. Staying true to the original spirit of the A-Frame, the Modern A-Frame is compact, bold, and features full-height glass walls, loft space, and the same no-nonsense building process that that accompanied the original. Lindal also has five pre-designed homes to choose from that range from 1,200 sq ft to 1,900 sq ft. Or you can customize and design your own to fit your needs -- Lindal's local dealers, most of whom are NAHB Green Building accredited, help design each home specifically for its site, taking into account environmental conditions and solar passive design. Lindal Cedar Homes' A2 1500 Modern A-frame is a two-bedroom house with a second story lofted above the main living area. It also includes the pitched roof and clerestory windows. Lindal Cedar Homes' A4 1700 Modern A-frame is a two-bedroom house with the second room upstairs. 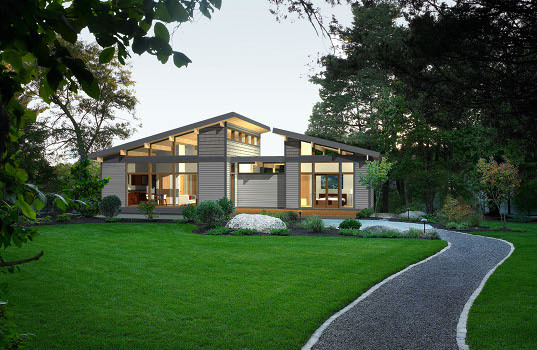 The flat roof line and central breezeway give the home a modern profile. Lindal Cedar Homes' new A5 1900 Modern A-frame is a two-bedroom house in the shape of an L with a large central living area and an upstairs bedroom with a flat roof. Lindal Cedar Homes' Modern Studio is the smallest version of the Modern A-frame and is perfect for a backyard office, a studio, or an extra bedroom.